The Cold War is supposed to be over, but it’s still going strong at our house. 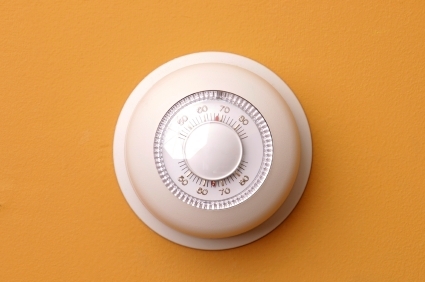 Every year about this time, the battle over the thermostat begins. Finally, the winter temperatures climb out of the negative digits and spring into something more reasonable. I wouldn’t call it “hot”, not yet. But a welcome warmth is definitely in the air. The furnace is shut down, the space heaters in the bedrooms are shoved into a closet, and the gas fireplace goes on summer vacation. In the midst of all this loveliness, wars and rumors of war are brewing. I am married to a fair-haired Norwegian who thinks sixty degrees is balmy. I am a fair-haired-due-to-highlights English-Scottish-German-Cornish gal who basks in eighty degree heat. Thus, when PB walks by the thermostat, he sets it low; I follow close behind and crank it back up. If I go to bed before he does, I will inevitably wake up in the night shivering, having had a nightmare about Antarctica. If he retires first, the bedroom is, well, toasty, and he is thrashing about dreaming of Shadrach, Meshach and Abednego. Sometimes we go to great measures to ensure our temperature of choice. For instance, we might be going somewhere so I’ll get in the car because he is taking his time in the bathroom. He comes out to the car with a little grin. “Hmmm,” I think. “Honey, I forgot something! Be right back!” I come back out and his grin is gone, but I’m whistling a little tune. This can go on for a while. It’s not a big deal; we’ve lived with each other for thirty-one years. If this is the worst of our battles, we’re doing ok. I’ll just keep the electic mattress pad plugged in. And he will just have to keep the ice cube trays filled. Maybe we can meet in the middle, like at seventy degrees. Brrrr.